Deacon started a new child care program at the school last week. They do a preschool curriculum and it's for kids age 3-5. The daycare lady that we loved and adored abruptly closed her doors to pursue another career and we were devastated! We found another in home daycare as soon a we could and he did not like the change :( she didn't have any other kids his age and really didn't seem to know how to entertain older kids so when the school had an opening we jumped at it!! If you know Deacon you know how social he is and how he loved his 'friends'. We just knew he'd thrive in a school setting and we were right!!! He looooves it!! Most parents worry about dropping their kids off for their first day but not us!! He barely gave me a hug and kiss before he was running to his new classmates to join them! What a relief! 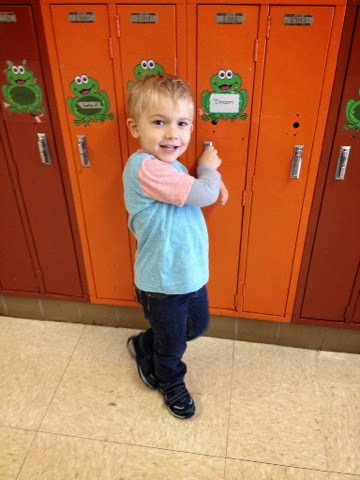 He is learning a lot and already making new friends :) here's a pic of him so proud of his locker on his first day.